Rrrrrf. Er, excuse me. I'm new at this. My name is Pluckie, and I hope I'm doing this in a way that's understandable to people. I'm a dog, you see. I'm told that I'm a spaniel-terrier mix. My coloration is mostly black, but my paws and tails are white. And that's one of the reasons for what happens in the first Superstition Mystery, Lost Under A Ladder. Why does my coloration matter? Well, I wouldn't have known it, but for humans to see a black and white dog when they're on the way to a business meeting is supposed to be good luck for them. All I did know was that, when I was with my human Rory Chasen when she was trying to visit a bookstore in the town of Destiny, California, I smelled and heard something wrong next door, in the Lucky Dog Boutique. No, it wasn't rotten dog food or anything like that. It was a person, and my senses said there was something wrong. I dragged Rory to that shop, and we found a sick human, Martha, lying in the back room. She was conscious enough to get all excited to see me. Martha soon told Rory she was going to be just fine, since seeing a black and white dog on the way to a business meeting is good luck. What is luck--good or bad? I don't exactly know, but I gathered from listening to Rory that the whole town of Destiny revolves around something called superstitions. That's supposed to be things humans can do to try to control their fates, like if they knock on wood or cross their fingers and stuff like that. Me? Well, I can't cross my toes on my paws easily. I don't knock on wood, either. I see and smell a lot of things they call heads-up pennies on the sidewalks of Destiny, but I'm afraid I'd accidentally swallow one if I tried to pick it up in my mouth. I've licked a couple, and they don't taste good--not like good meat or even tasty kibble. Anyway, I didn't mind when Rory decided to stay in Destiny for a while, and I liked all the attention I get from people when they learn I'm good luck and helped to save Martha's life. She's a nice lady. The thing is, I also sensed something wrong in the back room of another shop, the Broken Mirror Bookstore next to the Lucky Dog Boutique. The person lying there didn't wake up and thank me and call me good luck. He never woke up again. And what I'd smelled was his blood. Time for me to go outside for a romp, and more. If you want to know more about what happened, Rory says you'll need to read Lost Under a Ladder. She also says it may be good luck to read it--especially when that strange human holiday called Halloween is soon. 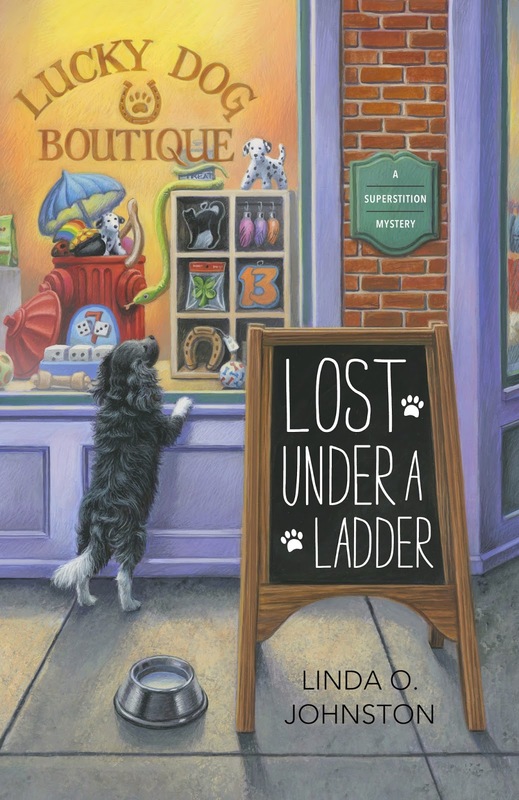 LOST UNDER A LADDER, the first Superstition Mystery by Linda O. Johnston, is available now! Why are humans surprised when we sniff out interesting things? And why aren't they more excited by all those smells? Sorry for taking so long to respond, but the human who can post things for me, Linda, said she was at a writers' conference today. I think humans are surprised about all the smells we like because they just don't have good senses like we dogs do. Don't know how they can stand it, but we can feel sorry for them, especially if they keep on feeding and walking us.